The well-being of our children and the health of our societies are greatly influenced by our schools. A child’s developement must be carefully and lovingly guided if he or she is to have a firm foundation for becoming a socially balanced and productive adult. We cannot know the demands which the future will place upon our children, but it is clear that inner strength, intellectual flexibility, empathy and independent judgement will be qualities vital to their future. Hence Waldorf education is a schooling system that chooses, as its prime focus, to prepare the student for life. At the same time, it prepares the student to meet the requirements of the school leaving certificate with confidence and has a record of very good results. It is also a form of eduaction that finds a harmonious accord with all the people in South Africa and the world. The curriculum is designed with the growing child in mind. It mirrors the inner and development of the child, following the developmental stages of childhood year by year, and seeks to give the child experiences that are both relevant and satisfying. All the important material offered in conventional schools is taught with an approach carefully developed for each age, but the timing may be different. The breadth and depth of the curriculum is a unique aspect of Waldorf Education and the material covered is used as an integrated whole, with one part always enhancing the other. 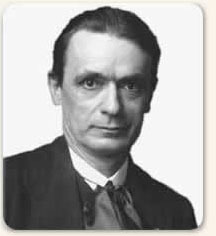 Austrian philosopher, scientist and educationist, Rudolf Steiner created a revolutionary form of education in 1919 which focused on guiding children to freedom in their adult lives, resulting in adults who are self-directive and who can take responsibility for their lives, their actions and the world they lived in. Steiner thought that schools should cater to the needs of the child rather than the demands of the government or economic forces, and therefore developed an education that encouraged creativity and free-thinking. His teachings recognise the individuality of the child. Through a balanced education, young people go into the world with confidence. 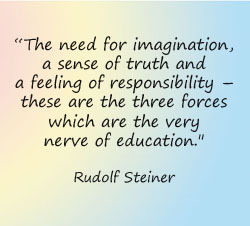 Steiner’s education of freedom became a unique and distinctive education that we now find in Waldorf schools today. There are estimated to be about 1200 Waldorf schools around the globe. Waldorf education has become the strongest independent school movement in the world. Waldorf education aims to educate the whole child, “head, heart and hands” or in other words, their thinking, feeling and willing. The curriculum is based on the developmental needs of the human being and therefore each stage of a child’s development is fully considered. The curriculum is broad and balances academic subjects with artistic, practical and creative teaching approaches. The cultural atmosphere and genuine love of learning is created through the use of art, craft, singing, dancing, folk tales, fairytales, poems, music, games and interaction with nature. The cultural atmosphere is a supportive and integral part of the academic learning of reading, writing, arithmetic, nature study, geography, science, languages, music and other subjects. Waldorf learners stand out in their self-motivated approach to learning, their ability to take initiative and the ability to express themselves. Waldorf schools seek to develop qualities of appreciation, respect, reverence, understanding and social conscience in every individual so that co-operation and concern for the whole community is a natural inclination.